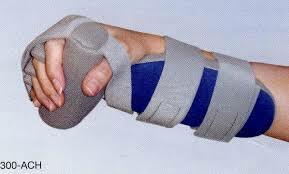 What is Upper Limb Contracture Splint? The Adaptable Contour Hand by RCAI offers a functional resting hand position following stroke, trauma or injury, and can be used in the treatment of arthritis, burns, and early wrist and finger contractures. Made of a durable, foam covered aluminum; the Adaptable Contour Hand can be bent without heat or tools, offering progressive extension of the wrist, thumbs and finger positioning. The washable, breathable foam liner eliminates potential pressure points, while it wicks moisture away, keeping the skin dry and comfortable. Restorative Care of America, Incorporated is dedicated to the manufacture of superior quality orthopedic and rehabilitative orthoses used in the treatment of conditions associated with traumatic injuries, chronic disease, post surgical procedures, and immobility, such as joint contractures and pressure sores. RCAI's prefabricated products are developed under the guidance of certified orthotists and hand-crafted in St. Petersburg, Florida, using processes and materials that ensure they will last.